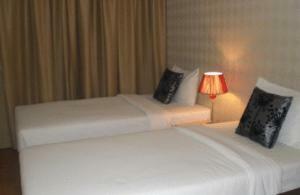 The Blooms is located in downtown Sathron offering simply furnished, modern rooms with a flat-screen cable TV. A restaurant, various shops and 24-hour reception is provided. The hotel is a 5-minute walk from Rama 4 Road, Bangkok's business district, and a 15-minute drive from Lumpinin MRT Station and Sala Daeng BTS Station. 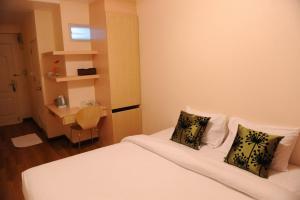 Bloom’s rooms offer air-conditioning and private bathrooms with hot shower facilities. Free water and a telephone are provided. The Blooms offers a minimart for guests to buy daily supplies from, and a beauty salon for convenience. Laundry and room service is provided. A restaurant and coffee shop are available as dining options within the building. 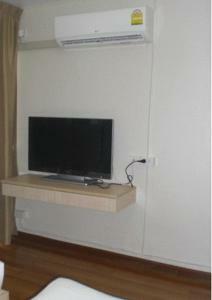 Air-conditioned room features a flat-screen cable/satellite TV, balcony and refrigerator. Shower facilities are included in an en suite bathroom. 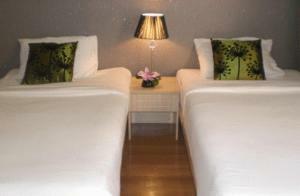 Larger air-conditioned room features a flat-screen cable/satellite TV, balcony and refrigerator. Shower facilities are included in an en suite bathroom. Air-conditioned room features a cable/satellite TV and en suite bathroom.